Good health for all mammals requires adequare intakes of EFA's. These are nutrients that neither cats, dogs or humans can make.They must come from your pets' diet. Even the very best pet foods do not provide your pets with enough EFA's. That's because Omega-3' (Fish Oil) is especially is very perishable. One really good FYI - if you are currently using a glucosamine product or plan to use one - you might consider the glucosamine along with Royal Coat. EFA's are also a great add-on for pets that need glucosamine-type products. Royal Coat Express is so concentrated. You need to use very little for great results. 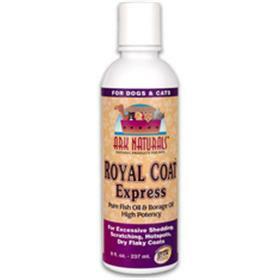 That's why we call it Royal Coat Express. Borage Oil Providing Omega-6, Fish Oil Providing Omega-3, Vitamin A, Vitamin D, Vitamin E (d-l alpha tocopherol).